Quarter campari tomatoes and toss with fresh chopped basil, olive oil and sea salt in a small bowl. Grill both sides of bread over medium heat in a cask iron skillet. If you’re having bacon for breakfast use some of the drippings and grill your toast in the same pan. Plate and top each slice with a heaping spoonful of tomatoes. 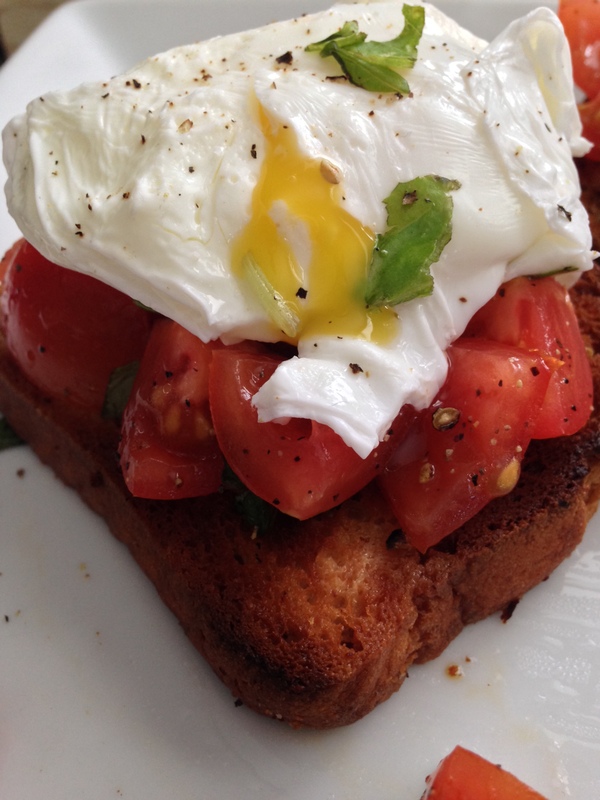 A soft poached egg takes about 2 minutes in boiling water (medium hard between 2-4 minutes). I’ve found cooking one egg at a time in a small pot of about 5 cups of water produces the best results. Bring cold water to a rolling boil, reduce heat to medium high and add your egg (slowly, using a ladle to ease it in). Once cooked to preference, remove egg with a slotted spoon and nestle on top of tomatoes. Garnish with fresh ground pepper, more olive oil, and chopped basil.